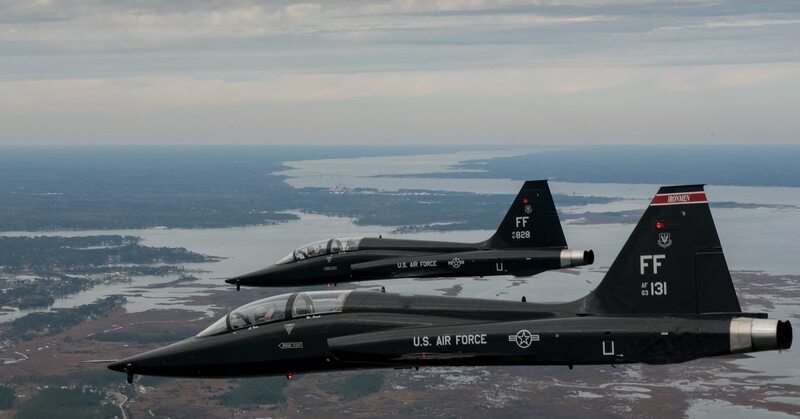 The crash of a T-38C Talon training aircraft in Texas last November, which killed one of its two pilots, was caused by a dual failure of the trainer’s troubled airframe mounted gearboxes, according to a new Air Force report. The Accident Investigation Board report also found that the crew’s distraction during checklist procedures resulted in an ejection seat not being armed, and led to the death of the requalification pilot, Capt. Paul Barbour. The plane crashed about 12 miles northwest of Laughlin Air Force Base in Texas on Nov. 20. The instructor pilot, Capt. Joshua Hammervold, ejected and sustained mild injuries, said the report, which was finished in May and posted online Tuesday. Barbour, 32, of Van Nuys, California, was taking part in requalification training after returning from a non-flying overseas deployment, the report said. Both pilots were with the 87th Flying Training Squadron at Laughlin, part of Air Education and Training Command’s 47th Flying Training Wing. The accident investigators found the input drive coupling shafts in both the left and right airframe mounted gearboxes on the T-38 sheared, which led to the crash. This was a long-standing problem with that T-38. The right gearbox had seven input coupling shaft shears over the previous 22 months, including the shear that led to its crash. But those failures didn’t happen frequently enough to signal maintainers to take a closer look, the report said. Additional scrutiny was only required if an aircraft had failures on back-to-back sorties, or happened twice in five sorties, the report said. The policies that were in place at the time had no rules requiring additional inspection or maintenance for an aircraft that needed seven coupling shaft replacements in less than two years. The report also said the left gearbox had five previous failures before the crash, but none were a sheared shaft. The president of the board, Brig. Gen. Joel Carey, concluded that a lack of maintenance guidance spelling out what should be done when the gearbox fails repeatedly was a substantial contributing factor in the mishap. As a result, Hammervold’s seat was armed, but Barbour’s was not. And if the ISS had been moved to both, the report said, Hammervold would have been able to trigger Barbour’s ejector seat alongside his, even though Barbour’s lever was not in the right position. Capt. Paul Barbour was a 32-year-old instructor pilot with the 87th Flying Training Squadron. Investigators concluded that this “task misprioritization” and “checklist interference” also substantially contributed to Barbour’s death. The report said that a pilot’s leg in the cockpit partially, if not completely, obscures the seat arming lever, which makes it hard to tell when that has been overlooked. The report concluded this was another factor in the crash. Hammervold and Barbour waited 56 seconds after realizing they were in trouble and would have to bail out, before trying to eject, because they were worried the plane might crash into a residential area. While that meant they successfully avoided the residential area, it meant there were only seven seconds between the time Hammervold successfully ejected and the moment when the plane crashed in the desert. The report said that had they been able to start trying to eject earlier, Barbour might have had time to figure out what was wrong with his seat and eject. Barbour is survived by his spouse, parents and sister. The $11 million plane was completely destroyed.